RIYL: CHVRCHES, Passion Pit and Hadouken! Metric have been extremely influential in bringing electropop within earshot of Canadian alternative fans. Two time Juno award winners for alternative album of the year in 2010 with Fantasies and 2013 with Synthetica, the band looks to extend their past success with the release of their new album Pagans In Vegas. The album dives into a mix of electronic synths but sprinkles some textbook alternative rock in between the cracks. “The Shade” sounds like a mixture gone wrong. The glitchy, 8-bit style synths and theremin draw away from Emily Haines vocals. It sounds as if they wanted to add some diversity to the track and instead just settled for a little bloop scattered across the track. “For Kicks” is a heavier track that powers through with the use of heavy synths and deep tones. Haines’ vocals are freed from the electronic mixture that they were trapped behind and it gives her voice more power. Each element really comes together and really shows the arrangement working out for the best. “Blind Valentine” is a song that draws from more analog instruments rather than traditional. The synth plays a large part in bringing the vocals along and showing the transfer of emotion throughout. Haines’ uses a wider range in the song and utilizes auto-tune to adjust her voice to the changes of the pitches. The song has a great combination of elements and brings out the essential qualities of an electropop song. 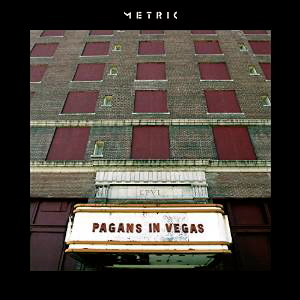 Pagans In Vegas serves as a changing point to Metric’s sound. Long gone is the full on analog anthems, traded instead for traditional rock sounds. The changes take away from some of their songs, but they still try to have that electronic presence that they did two years ago on Synthetica. Even with all of the changes, Metric announced they were working on a project full of their classical analog sound. Even if this change is not permanent or their best effort. It is interesting to see the direction the band is going and what they are doing to stay current among their musical peers.